We are a 5 Star Sustainable School!! 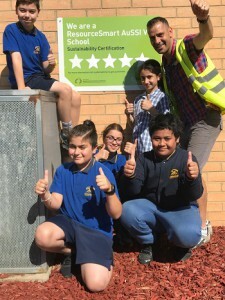 Roxburgh Rise Primary School is officially a 5 Star Sustainable School. To become a Sustainable School, Roxburgh Rise Primary School were required to demonstrate continuous improvement against benchmarks that were set in the areas of planning, biodiversity, energy, waste and water. Having strong links with the school community, broader local community and local community groups. Incorporating sustainability into the school’s curriculum across all learning areas and year level.